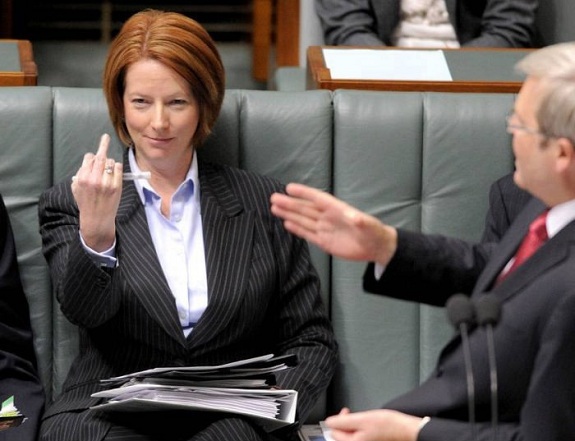 Australian Prime Minister and co-founder of EMILYs List in Australia, Julia Gillard, has been spectacularly dumped by her own party last night in the face of certain electoral wipe-out in the September 2013 federal election. The ousting comes just over three years to the day that she dislodged the man who has now just replaced her – Kevin Rudd. Rudd stepped into his new role as Prime Minister after winning a 57-45 leadership ballot of Labor lawmakers. It also comes days after she delivered a much-maligned speech in which she raised gender and abortion as issues in the next election.